Home » Columns » Praising the Lord for Cornerstone Fellowship Church! Praising the Lord for Cornerstone Fellowship Church! The ministry of the Cornerstone Fellowship Church of over 57 years had a positive impact for the Kingdom of God and for that God is praised. A bit of sad news was shared during conference council: the Cornerstone Fellowship Church was closing in June 2017. While we accept this reality, we prefer to focus on and thank the Lord for the congregation’s many years of ministry. The congregation began services in 1958, formally organized in 1962, and closed in June 2017. 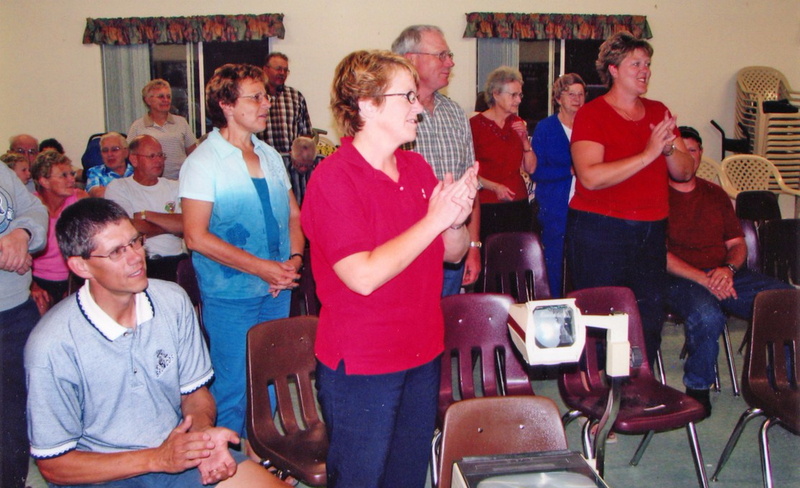 It originally began as the Swift Current EMC, an extension of the Wymark EMC located at nearby Chortitz that was started through a revival among Sommerfelder Mennonites in 1958. When some people affected by the revival moved to Swift Current, they began to hold Thursday night services at the rented Southside Hall in 1959. In August 1959 the former Mennonite Brethren church in Swift Current was purchased and a Sunday School, in German, was started. The first Sunday morning service was on 29 November 1959. There was a desire to establish a church in Swift Current for the many people who were relocating into the city from the rural churches in the area. From the outset, the church provided biblically based teaching to many people from Low German background. The congregation provided a witness and a place for people to grow in their Christian faith. K.P. Unger was the first worker, being sent in 1960, with the outreach being jointly that of the Wymark EMC and the EMC Board of Missions. The church became formally organized and autonomous in January 1962 within the Evangelical Mennonite Conference. Through much of its history the language of worship was English; the transition from German occurred in the 1960s. For at least two decades the congregation provided a manse for their pastor. After forming, the church enjoyed an extended period of spiritual and numerical growth, moving from their original building into a larger facility to provide for the expanding ministries. Many EMC missionaries and pastors originated from the Swift Current and Wymark churches, and some were still serving as of 2017. Eventually, the congregation relocated to the former Swift Current Bible Institute campus, which was the location of the 2002 EMC Convention. Unfortunately, the campus required extensive repairs and maintenance and became a drain on the church. It was sold in 2012. Several attempts to revitalize the church were unsuccessful. In 2003 the congregation decided to rename the church to the Cornerstone Fellowship Church. In the last several years, they have had two pastors on staff in an effort to reignite the church in the community. They have provided a vibrant children’s program in the past several years. In March 2017 the congregation made the decision to shut down operations as of June 30, 2017. The EMC General Board was made aware of this decision and accepted the decision of the church with sadness. While it was disappointing to see a church close its doors, there was gratitude for the many years of vibrant ministry of the Cornerstone Fellowship Church in the community of Swift Current. The ministry of the Cornerstone Fellowship Church of over 57 years had a positive impact for the Kingdom of God and for that God is praised. Resources: Canadian Mennonite (Aug. 22, 1958): 1; Unpublished history, 2 pp. Mennonite Historical Society of Canada collection, Mennonite Archives of Ontario; Tim Dyck interview with Rev. Lester Olfert, 2017; D. K. Schellenberg, “Swift Current Church Profile,” The Messenger (Sept. 23, 1983): 5-7. Note: This article is partly based on an earlier article by Marlene Epp (GAMEO, 1989).